United tactical liner lock that is in near mint condition with very light carry wear but it has not been sharpened. It is all stainless steel both blade and frame and 4-3/8" closed. It is marked UC447 Surgical Steel Japan on the back tang and United on the front tang. It does not have a clip and was not made for one. 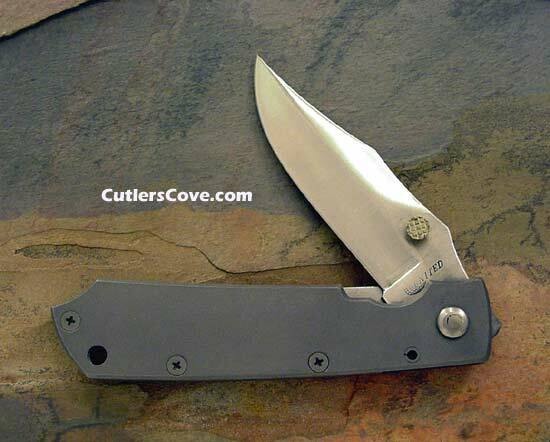 It is a stout, good looking, Bowie style blade and well made quick opening folder. It is from the mid 1990's and is a early example of the tactical knives to come later in that decade. Good example!